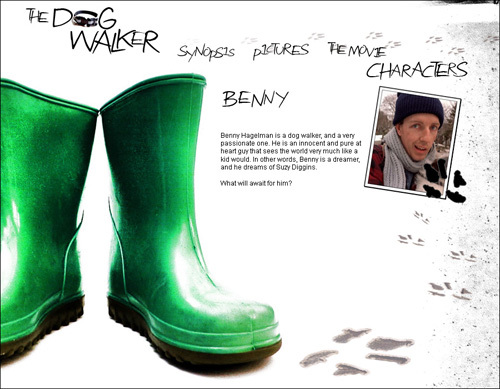 This is one of five series of mockup images for the website of the movie entitled “The Dog Walker“. We watched a number of various-genre short films in Story For Design class, in which instructor Jennica Harper assigned us a short film to work on as if it were a real client. We analyzed the movie, its elements, its structure to finally come up with an idea on what to do for some sort of website or marketing device. Working in a film like The Dog Walker made me realized how difficult and how complex getting ideas to show the spirit of the film. Moreover, how complex characters, story structure and foreshadowing can be. I enjoyed working in this project, mostly and foremost, because I love films… and because we had pretty much creative control over the website. Working in that kind of situation or environment would be like a dream come true to me, in which I am allowed to explore a movie from a viewers’ point of view, and also to explore all the ideas that come up later as I start making decisions. This entry was posted on Friday, August 5th, 2005 at 9:21 pm	and is filed under branding, sketches, typography, web design. You can follow any responses to this entry through the RSS 2.0 feed. Both comments and pings are currently closed.